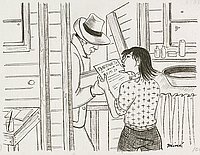 A woman with flipped forelock of hair, Mine Okubo, receives notice of "relocation" out of Tanforan from man in hat at Tanforan Assembly Center, California during World War II. 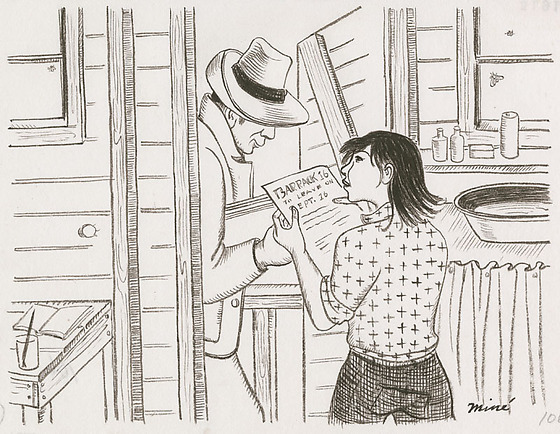 Dressed in cross-patterned shirt and dark pants, Mine stands with back to viewer as she holds up notice, "Barrack 16 to leave on Sept. 26," from a tall man in hat standing in doorway holding a sheaf of papers. Brush in water sits on table beside a book behind a wooden wall at left. Basin sits below window at right. Signed at bottom right corner: Mine. Written in pencil, bottom right corner: 106. Written and circled in pencil, bottom left corner: 106. Stamped in black ink on back, top left corner: 5191. Written in pencil on back, bottom right corner: 106. Drawings for the book, Citizen 13660, began as sketches and drawings created by Okubo while incarcerated at Tanforan and Topaz to tell faithful friends about camp life and were intended for exhibition purposes. Drawing is on page 111 of book.